The equipment I gather together includes the Glucometer Elite, the Elite test strip, Microfine lancets, and kleenex. The Glucometer Elite comes with a "lancet device", which is the little machine that shoots the lancet (or short pin, to draw blood). 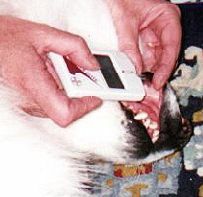 Most people don't use the automatic device on dogs, because they make a sudden noise and movement. I just use the lancets themselves. I twist off the cap and do the "stick" manually. Before I actually started testing our dog Chance (a Samoyed), I did pretend tests, just rolling his lip and squeezing it a little, then telling him what a good boy he is. A lot of the "ease" of home testing depends on a calm and pleasant atmosphere. Vets draw blood from a vein, cat owners do ear sticks, dog people mostly do lip sticks, though I have been hearing of a few other places, like paws and elbows (and even nail overclipping, which would be terribly painful and is not recommended). To do an actual test, I have Chance lie on his side on the floor, though a smaller dog could lay in your lap. I roll back the upper lip and gently wipe the inside dry with a kleenex, then I hold the lancet and stick the inside of the lip close to lip edge, and closer to the back of the mouth than the front. Try to keep your dog from licking away the blood drop. Chance getting a lip prick. I wait a couple of seconds for a spot of blood to appear, then I gently massage the area if necessary to produce a large enough drop. Then I dip the test strip into the drop of blood and it slurps it up; the meter will beep to indicate it has enough. You can take the test strip away from the lip now, though I always hold the strip in the blood for an extra five seconds. Then I dab his lip with a kleenex, and press lightly for a few moments. After 30 seconds the Glucometer beeps again to indicate that you have your bg reading. After I have the bg reading, I pet and praise Chance for a moment, then record the time and the bg number on his chart. If there is anything unusual about the result, very high or very low, I always test again. And if you can't hold the test strip in the blood after it signals the "full sample" beep, that's ok. As long as you can see that the test strip has the proper amount of blood, its probably ok. The best part of this method is that it is painless. Second best is that it is a safe area which heals quickly. Hilary, who first taught me the technique, said it was much more time-consuming and complicated to describe than to actually do! It takes a bit of practice, but I now find it quite an easy procedure. Kerry also provided me with very detailed instructions on how she tested her Samoyed, Melody. We all need help and encouragement at first.